What do acclaimed anthropologist who does field work in Brazil, a Coca-Cola executive, a first-round NFL draft pick and an immigration lawyer cited by the NY Times have in common? Charlotte’s Piedmont Middle School showcases what it means to be an outstanding magnet school by embracing diversity and challenging its students to meet high academic standards. Recognized as a “School to Watch” by the North Carolina Middle Level Educators since 2011, and recently designated a national demonstration school by Magnet Schools of America, Piedmont is known for its in-demand International Baccalaureate (IB) program and dedication to inspiring its students to make the world a better place. Piedmont Middle School teachers bring a wealth of knowledge and experience, and they use it to push their students to recognize and celebrate their individual strengths, interests and opportunities in the pursuit of social responsibility and global awareness. 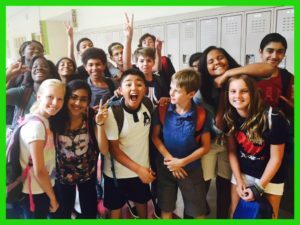 With a goal of preparing all students to succeed in a diverse, global society, Piedmont Middle School is a shining beacon of all that a magnet school can be. Piedmont students benefit from the school’s multifaceted, innovative curriculum. Students are required to study eight subject areas and learn at least two languages as part of its multilingual profile. Students have access to Piedmont’s state-of-the-art media center, which includes books, computers, iPads and 3D printers, all with the goal of encouraging students to reach the highest levels of academic, social and personal growth. Because of Piedmont’s ambitious standards, its alumni have succeeded in rising to the top of their respective fields. Former Piedmont students include an acclaimed anthropologist who does field work in Brazil, a Coca-Cola executive, a first-round NFL draft pick and an immigration lawyer whose work helping refugee families has been featured in The New York Times. Piedmont lives up to the idea that with a great education, you can become whatever you want in life. The school’s excellence has not gone unnoticed. For the past five years, Piedmont has been the only Charlotte-Mecklenburg middle school to receive an impressive “A” rating on the North Carolina School Report Cards, with students performing above the district and state averages in math, reading and science. And it’s not just the students who are exceeding averages; the school surpasses the district and state in the proportion of staff who are fully licensed teachers, teachers with advanced degrees and National Board certified teachers. The dynamism and passion of Piedmont’s faculty and staff play a major role in the college and career readiness of its students. Piedmont’s athletic programs, social clubs and yearly events are invaluable to the school’s cultural vibrancy. The Piedmont Pirates participate in a variety of sports, including football, basketball, volleyball and soccer, which help student athletes learn teamwork and good sportsmanship. All Piedmont students participate in student clubs every Monday, choosing from activities like ballroom dance, poetry, needlework and more. These also include a host of competitive clubs, such as the nationally ranked Piedmont Science Olympiad team, which was awarded sixth place at the 2018 Science Olympiad National Tournament. And Piedmont students have the opportunity to enjoy yearly drama and arts performances, trips out of state to places like Atlanta and Washington, D.C., and cultural events including International Night, Day of the Dead and Black History Month events. Service to the community is an integral part of an IB education, and Piedmont strives to develop and maintain community partnerships that offer students innovative experiences in and outside the classroom. For example, the school’s partnership with Charlotte Center City Partners gives students the opportunity to embark on walking field trips, including an “Amazing Race” challenge, where seventh graders locate historical and relevant artifacts in uptown Charlotte. Over the years, these partnerships have included Clean Air Carolina, Friendship Gardens, the University of North Carolina at Charlotte and Equitas, a nonprofit organization that supports vulnerable students in Malawi. Piedmont Middle School has developed an award-winning instructional program that equips its students for the challenges of the 21st century. “We believe all students can learn, and our instructional program is developed to meet the diverse needs of students and prepare them for the future,” says Karen Gorman, Piedmont’s Academic Facilitator. The curriculum, faculty and staff all tie into the school’s mission “by encouraging all students to reach the highest levels of academic, social and personal growth.” Piedmont is clearly succeeding in that effort – and in doing so, continues to demonstrate the power of a magnet school education. Success Stories » What do acclaimed anthropologist who does field work in Brazil, a Coca-Cola executive, a first-round NFL draft pick and an immigration lawyer cited by the NY Times have in common?